A Journal of Mental Science and a Record of Human Nature. Brighton, then London, England. Publisher: S.C. Slade; L.N. Fowler & Co.
1/1, January 1896-December 1904. 16 pp., 1s. 6d. a year. 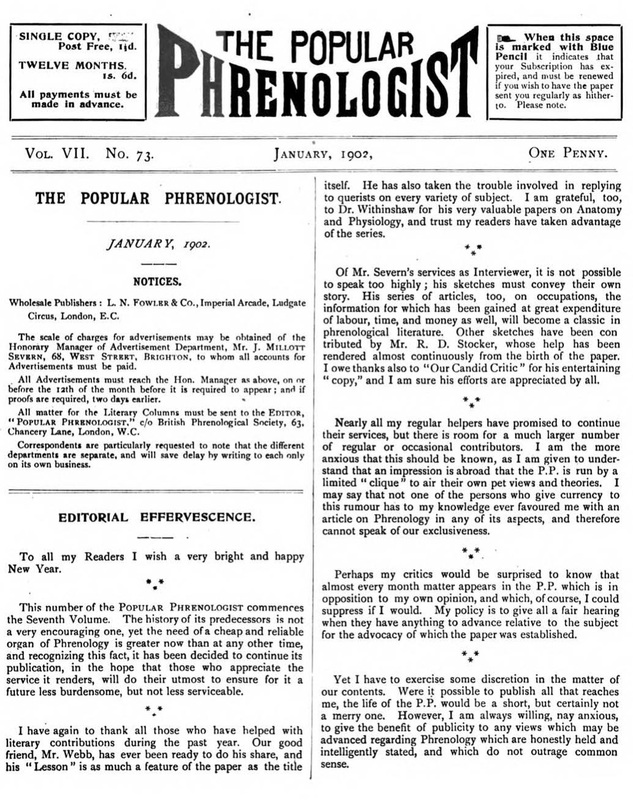 While the title appears today to be an oxymoron, the journal endured for 9 years with a mixture of delineations of the skulls of the famous (including Annie Besant), histories and biographies of the those prominent in the movement, and above all attempts to establish phrenology as a science. The journal provided a regular Directory of Phrenologists practicing in Britain and carried advertisements for the Fowler Phrenological Institute in London which offered classes to those interested and sold its courses by correspondence as well (L2 2s.). Advertised in Suggestion, September 1903. Yale University; BL; Harvard University; University of Minnesota; UCLA Library, etc.